A. CAST STEEL THREAD PROTECTORS Protectors for pin and box connection are made from steel castings (60000 psi tensile and 30000 psi yield) meeting ASTM spec no. 27 grade 60-30, with heavy duty bails for pick up and laying down drill collars. Threads and shoulders are precision machined. 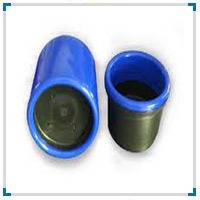 - The Thread Protectors are designed to provide protection to the connections during handling and transportation, and to prevent debris from entering the threads and tube body. A thread protector is used to protect the threads of a pipe during transportation and storage. Thread protectors are generally manufactured from steel and can be applied to the pipe manually or automatically . We are manufacturer of all types of Thread Protectors and we are exporting to Austria , Dubai , Singapore. We have a 50% spare capacity available with us and we can supply the 25000 Sets Per Month. We are manufacturing all Type of thread Protectors ranging from 2 3/8 to 13 3/8 in Press Steel. Thread Size: 2 3/8"- 8 5/8"
With immense market knowledge, we have been able to provide optimum quality Plastic Thread Protector. drill pipe protectors has you covered completely when you cant take chances. Our lightweight plastic, heavy-duty plastic, and all-steel models are engineered to cover the entire thread form and seal area on both internal and external drill pipe threads. Being a leader in the industry, we are engaged in offering a qualitative range of Column Pipe Thread Protector to our customers. Universal Tube Accessories Pvt. Ltd.
Winding Protector Caps Available in V3, V4 and V6 Pumps at Twince Engineering.